We say it a lot, but the best clients and greatest success stories are with those who are passionate about their business. Without exception that is always the case. So it’s pretty exciting to see a client and entrepreneur who is extremely energetic and passionate about his companies be recognized for his outstanding efforts and achievements. 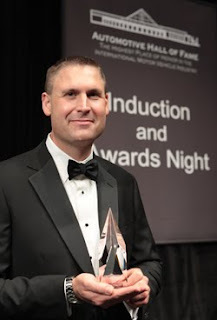 Last week, Jesse Berger, President of Eastern Michigan Kenworth, received the Young Leadership & Excellence Award from the Automotive Hall of Fame. SOZO | Pivotal has had the pleasure of working with Berger for over five years. When we started he operated one location, Berger & Sons, in Clinton Township. Today, Berger has quickly expanded his group of Kenworth truck dealerships and in addition to his original location, has dealerships in Dearborn, Sterling Heights, Lansing. Last year he was named to Crain’s Detroit Business’ 40 Under 40 list. Too often you get wrapped up in the day-to-day work, so it’s refreshing to be able to attend an event like this and see one of your business partners recognized for his contributions to this region. Take a moment to watch this video and listen to one of Michigan’s greatest young business leaders. Jesse Berger — Automotive Hall of Fame Speech from SOZO Pivotal on Vimeo. Author: admin In: SP News Comments: Comments Off on This Is Working. We’ve decided to let you in under the hood, so to speak, here at SOZO | Pivotal with the launch of a behind the scenes video series, This is Working. We figured we’d get two episodes under our belt before we made any type of formal announcement. Sometimes you don’t know how these things are going to work out. We didn’t want to make any grand promise that we couldn’t deliver. Two episodes was our benchmark for saying this is real, and here we are…Episodes 1 and 2. So why are we doing these quick videos that take you into the inner workings of our small business? One answer is because The Apprentice misses the mark. It’s not about selling lemonade and designing a brochure. But seriously, we felt it was important to create a running documentation of what we’re experiencing and how we’re growing our business in a tough economy. As we get closer to completing our first decade of entrepreneurship, we reflected on all of our experiences, triumphs and challenges. Good or bad—it’s all part of the adventure. Perhaps us sharing our experiences will help others. Who knows? We’re excited to start a new chapter in the journey of growing SOZO | Pivotal and building a socially responsible company focused on doing outstanding work. It’s a journey that’s going to bring things back to the drawing board to analyze what the company is doing and how it’s doing it. You’re going to get a look into the inner workings of a real Michigan-based business that refuses to let recessions, FOR LEASE signs, dismal national statistics and unemployment rates drag us down. There’s excitement and opportunity all around us, but sometimes it’s just a little harder to find. So come along as we show you how we’re repositioning our successful branding and design company. Four years ago Kimberly Leclercq and I started SOZO | Pivotal. Along with that exciting new beginning came the responsibility of creating a new website full of information and project work to showcase that we really did know what we were doing. The information part was easy. We are never at a loss of words when it comes to talking about what we do. However, the online portfolio has been a thorn in our sides for a long time. After a year or two we finally got a bunch of screen shots up there showing corporate identity work, screenshots of websites and photographs of printed materials. The problem was that it just didn’t do the work justice. Sure, it looked great, but there’s so much more to our work than just what you see. An online portfolio is a must for people who solely practice graphic design, printing, photography or website design. But us showing a logo or a brochure design is akin to showing just the answer to a long and difficult calculus problem. We all remember the excitement in 7th grade when we realized the math answers were in the back of the book. That thrill was dampened when the teacher wanted to see our work to know that we truly understood the problem. The same can be said for what we do at SOZO | Pivotal. We provide answers to our clients through the use of a wide variety of tools, but it’s the strategy and creative thinking that guides us to the right solution. So you can see why showing images of our work just doesn’t tell the whole story. Nonetheless we’re excited to have finally figured out a way to capture our process — from strategy to design. The hardest thing for us was getting the term portfolio out of our heads. All we saw was a nicely cataloged booklet of fancy artwork and nice photography. Clearly that was not the right approach in communicating and illustrating what we do as SOZO | Pivotal. Please take a moment to look at our new website and some of the relationships we have with our clients (or as we like to refer to them, our friends). Also, please take a gander at the Beyond Strategy section. Here is where we take a closer look at individual client projects that are the results of clearly developed brand strategy. It all makes perfect sense to us…finally. We hope that you find it just as informative. If you ever have any questions about the work that we’ve done with our clients or how we can apply what we do to your needs, please do not hesitate to contact us. Thanks for stopping by and while you’re at it, please consider following us on Twitter and becoming a fan of SOZO | Pivotal on Facebook. Four years ago today Kimberly Leclercq and I officially formed SOZO | Pivotal and it’s been a fun, exciting and challenging 1,461 days. It’s amazing what can happen during a span of 48 short months, but we’re excited about the next 48…that’s for sure. We’d like to thank all of our clients, friends, associates, partners and employees for all of their support. Prior to forming SOZO | Pivotal, Kimberly and I had both run our own companies—her’s SOZO and mine Pivotal—which we had started back at the turn of the century. So actually, we’re both celebrating 10 years as business owners. You’re probably thinking four years isn’t all that much of a milestone, but screw it, we’re excited! We feel this four-year mark is even more notable not because so many businesses and partnerships fail to make it this far, but because we know we’re just getting into a groove! The next four years are really going to be something special…stay tuned!